Brandon Sanderson’s Mistborn series are epic fantasy novels that center on the world of Scadrial. It is a place where some people can call on metal magic using the power of Allomancy, having been bless with it by the all-powerful Lord Ruler. Related to the Lord Ruler, the nobility lead a life of intrigue and treachery. It’s an awesome series and I highly recommend reading it if you like fantasy stories. 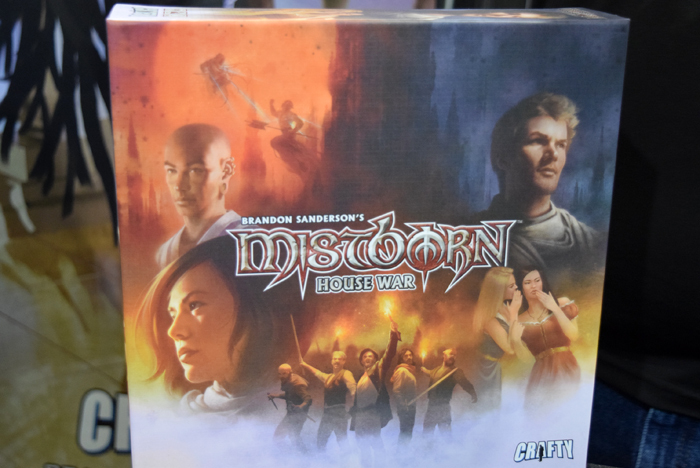 Kevin Wilson‘s board game adpation, Mistborn: House War, sets the players as the nobles, looking to become the head of a Great House by currying favor with the Lord Ruler. We sat down with Patrick Kapera, co-founder of Crafty Games, at PAX Unplugged to learn more about this exciting board game. You can find out more at crafty-games.com, like them on Facebook, and follow them on Twitter @Crafty_Games. Sign up for their newsletter for the earliest and best info about all their products.